The month of February is already upon us. This past week went fast and it’s hard to believe its past time to pen this column again. Saturday we ground all the hamburger from the beef we butchered. 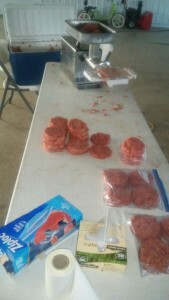 We made around two hundred fifty hamburger patties and packaged all the hamburger for the freezer. I will make vegetable soup yet from the meat we cook from the bones. This will wind down all the butchering from the beef. We canned the beef chunks and some hamburger. I like canned hamburger for casseroles. It doesn’t have to be fried before adding it so it saves a step. We also use it to make sloppy joes. 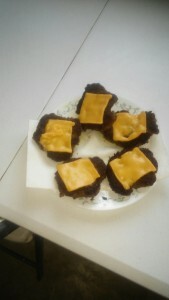 While working on the hamburger we got a call saying that Joe’s Uncle Benji Eicher passed away in Marysville, Indiana. Sunday we attended church in Charlotte, Michigan, at Mose’s brother Daniel and Marianna’s place. It’s always interesting to visit other communities. We appreciated the hospitality! We enjoyed visiting with Lydia Coblentz. Her husband Freeman was a cousin to my dad. He passed away twenty years ago. Lydia is almost ninety and has many interesting stories to tell from her youth. One of her granddaughters wrote a book called Seasons about Lydia’s life. I have the book and we all enjoyed reading it—a true story of an Amish girl growing up in hard times. Monday morning Joe and I and five of our children headed south for Marysville. We arrived in Scottsburg around 12:30 p.m. We got a few motel rooms then went to the visitation which was almost twenty miles from the motel. When we came back to the motel the children had fun swimming in the motel’s pool. All the motels in Scottsburg were filled with people that were attending the funeral the next day. Some people had to go to other towns further south for a motel. Marysville is a new Amish community with not too many families there yet. On the day of the funeral there were over one hundred vans there bringing friends and family from all over. The funeral was held in a large pole barn and I’m guessing there were more than one thousand people there. Our sympathy goes to Aunt Margaret and the family. Uncle Benji left to mourn fourteen children, one hundred thirty four grandchildren, and one hundred fifty eight great-grandchildren. We arrived back home in Michigan around 6:30 Tuesday evening. Daughter Susan, 20, and son Benjamin, 16, kept up with the chores here at home while we were gone. We had plans to butcher hogs on Saturday but changed our plans due to a funeral of an eighty-eight year old man from this community, Menno Eicher. He is a father-in-law to three of Joe’s sisters. When I was a young girl I was in the same church district as Menno. Menno was a widower for quite a few years. We plan to attend the funeral on Saturday. With two funerals in the same week my work has been pushed back so I need to get back to chores. We wish God’s blessings to all of you. Try this potato soup on these cold winter evenings. Place bacon in a large kettle. Add celery and onion and cook until softened. (Use bacon grease if desired.) Add potatoes and chicken broth. Bring to a boil then simmer until potatoes are tender. In a small saucepan melt butter, then whisk in flour and brown the mixture stirring constantly for a few minutes. Add heavy cream slowly while whisking constantly. Bring to a boil, then reduce heat and continue whisking until mixture thickens. Stir cream mixture into the potato mixture. Gently stir in cheese. Add salt and pepper to taste. Feeds 12 or more. Lovina, I am sorry for the loss of your husband’s Uncle Benji. I am glad your family was able to attend the funeral and be with the extended family. We have the book Seasons: The Real Life (Story) of an Amish Girl in our Church/school Library. It is signed by the author, if I remember right. I am at home now, so I am going by memory and I may not have the details correct. Elizabeth Byler?? Your picture of the table set up in the garage looks just like a work day at our house. It is nice and cold here at the moment for that kind of work (10 deg F outside). I have enjoyed reading your column in the email. Lovina, I have very much enjoyed reading your column. I did write a comment on the day this posted, a Friday, but I have not seen it here yet. It was the first time I wrote so I am not familiar with how long it takes for the comment to appear. I was sorry to read of the loss of your husband’s Uncle Benji. You and your family have our heartfelt sympathy. Your garage set-up looks very much like our own. Cold days make good work days with a protected environment.